This is the perfect keepsake gift and one of our most popular for new babies, first birthdays and christenings. This high quality Birthday Book is the opportunity to create a life story for your new baby. Parenting is a time consuming business and we don't always have the time to fill up pages and pages with weekly milestones but this book is much more practical! It is one book, 18 years and 20 minutes of time once a year and all the highlights are recorded. There is room for photos, comments and space to jot down milestones that end up as a life history and show that you were paying attention! This beautiful book comes in a plastic case to keep it safe and protected over the years. It has enough pages to fill 18 years worth of memories with a two double page spreads for each year. 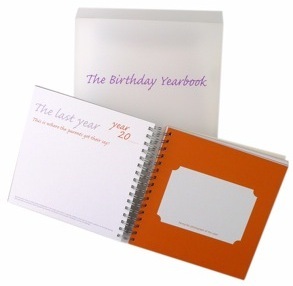 Include the birthday picture, the cake or the party and messages from guests or relatives and of course there is plenty of room for the parents to have their say about the year just gone. Created by Two Little Boys and with it's thick front cover and high quality card and thick paper internal pages, this is an album that will stand the test of time and still look good after 18 years. "the baby book for busy mums, one that will actually get used. Awesome keepsake!" Have a look at the rest of our range of keepsake books.